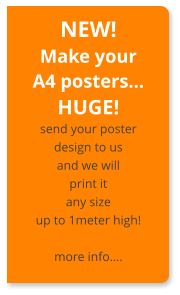 Make your A4 posters… HUGE! 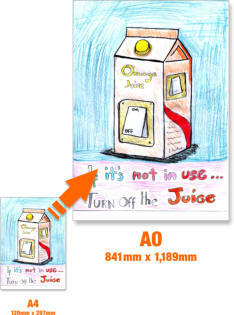 send your poster design to us and we will print it any size up to over 1meter high! How to order 1 Choose the size you would like your poster to be. 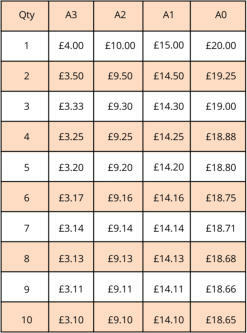 2 click the ‘choose quantity’ box under the required size. 3 Upload your original design using the file upload form. Your poster or design can be in any file format. use the file upload form opposite to send your design/artwork. Giving you the option to add your school crest or logo. Printed on tear resistant paper, available in any size up to 100cm x 100cm (regular size: 93cm x 93cm) options include: Matt laminate to extend the life of your poster and give a cleanable surface. Mounting on to a rigid white panel to add durability and present a more permanent display. Framing, using our aluminium snap frames which make swapping displays a breeze. When you want to change your display unclip the tamper-proof edges, replace the poster and snap the frame shut.